I guess my Monday deadline somehow morphed into Thursday…. Hello, readers. Guess what? I read some books! And I have opinions about them! Shocker, I know. Also, I totally lied with half those covers I posted last week. Sorry about that. I’m sad because I really want to like this title. I really, really do. But it’s so … it’s so … I don’t know how to explain why it isn’t working for me. I guess, when it comes down to it, honestly … it doesn’t feel like Barbara. It just doesn’t feel like her to me. This new role of hers, it’s so … “forced” is the best word I can think of to describe it. It’s not Barbara—not the one I know—and that’s kind of shocking considering that Barbara Gordon is Gail Simone’s bread and butter. If anyone at all understands that character, it’s Gail—they’re practically interchangeable. Yet, as much as I want this to succeed, it just isn’t firing for me. I wish I could explain it better … it’s just not right. It doesn’t feel right. And the writing style … there’s so much narration. That worked in Gail’s Birds of Prey when you needed the POVs of several characters, but it’s not clicking here. There’s too much of it; there’s too much telling and not enough showing. It’s so flat, and I … I don’t know how much more of this I can back. And that makes me so, so sad. You know what else? I have read this story before. I think that’s what’s really bothering me more than anything here, is that it still feels like we’re going backwards. Which, we are—literally, we’re dialing back the clock in terms of character ages and whatnot, but I also mean to say that we’re going backwards allegorically. The stories and the progressions of these characters have taken giant steps downward. 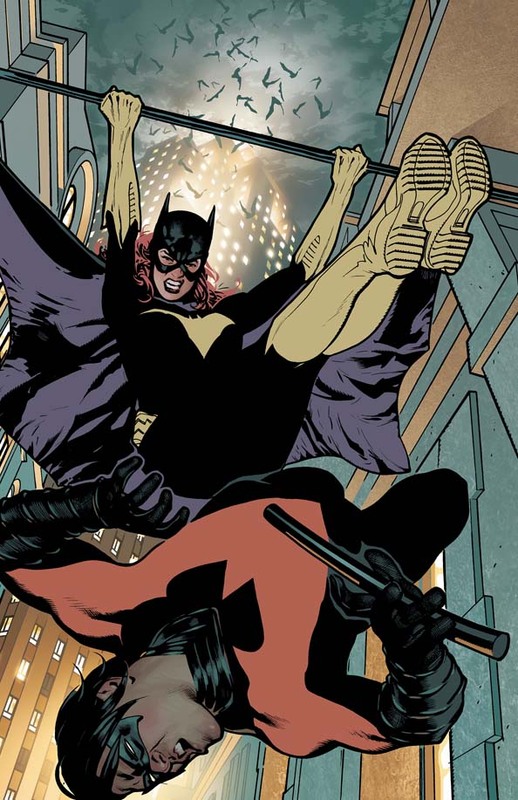 This idea of a character called Batgirl finding her footing—I have read this before. I read it in Bryan Q. Miller’s Batgirl run, and I even read it in Chuck Dixon’s Batgirl: Year One. Why am I reading it again? I’m not getting anything different this time, not one bit. Barbara healing and regaining use of her legs is only influencing this story on a very minor level—it isn’t enough to make these issues feel fresh or different. This issue was all about reuniting Batgirl and Nightwing. I should have been moved by it, but I wasn’t. Not even close. I put this book down, blinked a few times, and wondered what was wrong with me for leaving it feeling absolutely nothing. So … what does one do in this situation? Do I keep reading this in the hope that once the groundwork is laid and some of the setup “fluff” is out of the way, I might have a more interesting story? Might I feel more for this character by issue #13, as opposed to issue #3, and is it even fair to have to wait that long? Ardian Syaf’s artwork has been great. Other than that, I haven’t got much. A part of me doesn’t want to give up on the title, because I do love Barbara and this is apparently the only Barbara that I’m going to get for the foreseeable future. I also have a certain level of faith and respect for Simone, and I want to be able to lean on that. But with every issue of this so far, I’ve only left feeling disappointment. And I never thought I’d say that. …And with that, an interesting idea turns into utter horse poop, as Nick Spencer fills this issue with preachy drivel and a needlessly despicable downturn that I guess is meant to be humor. Biggest waste of $3.50. To say I was mortified while reading this on the train is a massive understatement. 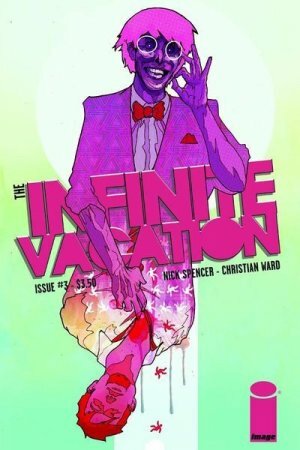 And to top things off, I read the solicit for #4 to find it isn’t even due on the shelves until April. Buhbye; I’m OUT. I was a little worried when this was first solicited, because with a title like “Not a Hero,” my immediate thoughts were that they were turning Magneto into a villain again. That would be the worst thing you could do to the character in my opinion, and just as bad a regression as Barbara Gordon re-donning the Bat cowl. Magneto has grown by leaps and bounds in the last few years, and I’ve always enjoyed him as a villain, but I find I love him even more on the side of the angels. His presence is still so very grey—he’s so ambiguous, and in the hands of a writer who knows how to use it, that’s an invaluable quality. And so I shook my fist at the sky for a bit at the thought that this wonderful drama might be taken away for something as utterly boring as Magneto turning “bad” again. Happily, upon reading this issue, I find that this is not the case. Not yet, anyway. 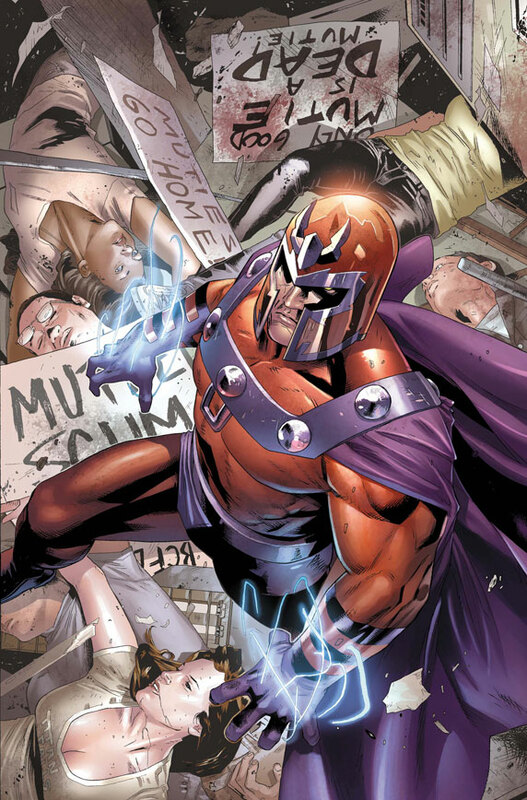 Our introduction to this story centers around what is something of a storytelling cliché—Magneto is being framed for murder. Exciting, right? Bet you’ve never read anything like that before. It’s okay, though, because there are things here that make up for the questionable originality, and by the end of issue one, we can see that ultimately the story is going to deal with much more than who’s framing Magneto. I have to hand it to Skottie Young—everyone knows him for his great artistic talents, but he’s making a transition to writing here, and he’s not doing a bad job of it at all. It most certainly beats out a majority of the crap you see on the Marvel shelves these days, and rather easily at that. Young has a good handle on the characters in issue one, particularly in a scene that involves Captain America and Iron Man calling out Cyclops and Mags to get their act together. The cliffhanger reveal at the end—I really should have seen it coming. I can’t believe I didn’t. It’s some good stuff. And Clay Mann on art duties … wow. What can I possibly say to do this guy justice? In a short couple of years, he’s hands-down become one of my favorites, and every book he’s on makes me drool a little bit. He’s wonderful. He’s coming to Boston Comic Con next year, and I am getting a sketch from him if I have to wait in line all weekend. Outstanding. Did this book blow my mind? No, but it did some things well, did other things great, and was all around an enjoyable read. I wasn’t asking for much more than that. More happiness! 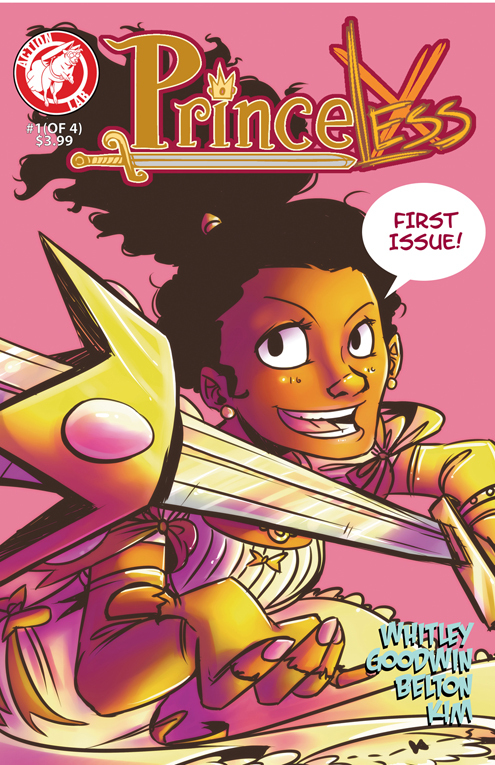 Have you seen this little bit of WIN called Princeless #1? Well if you haven’t, then you’re sorely missing out. It’s soooooo great. It’s so great. I remember reading about this on the internet somewhere and I wasn’t really planning on checking it out, but then I found it on the shelf and read the first three pages and was like OH MY GOD, THIS IS SO WONDERFUL. Three pages—that’s all it took. And, you know, that’s kind of a big deal in a situation where you’re paying four bucks for a book when you weren’t anticipating having the expense at all. But this was so worth it, and I absolutely can’t wait to have the next issue in my hands. This is a story about a princess named Adrienne who grows up being read stories about other princesses who get locked up in towers and have to be rescued by handsome princes who slay dragons and ultimately win the princesses’ hearts. Adrienne is baffled and outraged by this idea, criticizing and belittling the stories, and makes her mother promise her not to lock her up in a tower, only … of course you know that’s exactly what happens, right? The resulting scenario is nothing short of hilarious, adorable, brave, and pretty much unlike anything else on the comic racks right now. Whitley’s writing is beyond clever, and I found myself laughing at something on every page of the book. It’s smart enough for adults to enjoy, yet still written with a young audience in mind. This is exactly the type of thing you should be giving to the little girls in your life. Introduce them to comics now, with this. And actually, I take that back—it isn’t just for little girls; not even close. Adrienne is not the only character in this book—don’t let the “princess” thing fool you. Boys will enjoy this as well, and I encourage you to pick it up to find out why. If I could get you to read one book and only one book this week, I would give you Princeless #1, and I wouldn’t even blink. Since the debut of this title, I’ve had nothing but praise for Uncanny X-Force and Rick Remender. That hasn’t changed yet, and I don’t see it on horizon any time soon. Just when I think the story has reached a plateau and couldn’t possibly get any better, another issue comes out and BAM—I’m smacked in the face with the awesome. The problem with loving a book this much is that it makes it insanely difficult to review. When you have no criticisms, there isn’t much left to say beyond shameless, unabashed gushing. And you have to admit, that’s kind of boring to read. But I literally have nothing bad to say. There is nothing I would change about this book—not a thing. Not the writing, not the pencils, not the pacing, not the colors. Well … I suppose I might change the price … and maybe I’d make it ship twice a month, because I can’t get enough of it. But that’s all. Not much to ask. 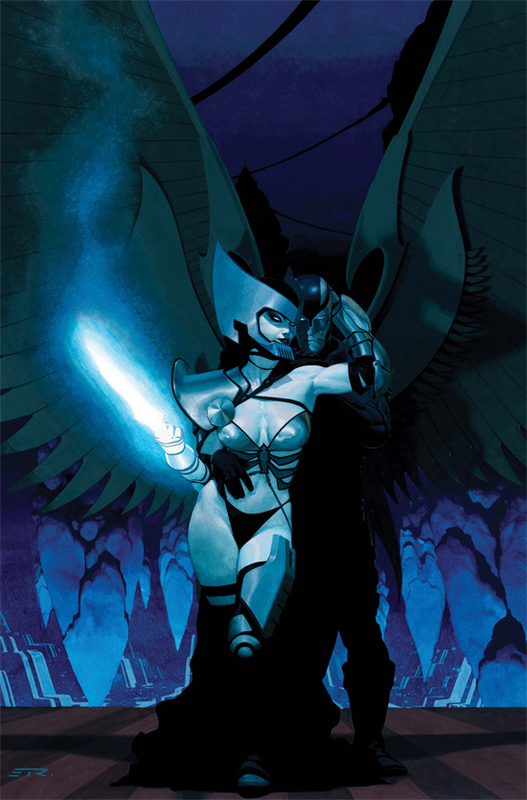 If you’ve been subbing to this title, you know that Remender has been building up the Dark Angel Saga for quite some time—since day one, in fact. It’s some of the most well-timed and patient writing I’ve seen in recent memory. The thing I love about this book is that when I pick up an issue, I can tell that Remender has taken his time with it. He isn’t writing with collected editions in mind or decompressing the story, as one might accuse of Bendis’ Avengers titles. No; there’s a level of thought and care and precision to what Remender does, and it comes through in his scenes and character interplay. It’s harmonious. It’s a melody to which I never want to stop listening. If even a quarter of the other books Marvel puts out demonstrated this much attention to their craft, I’d be a much happier comics reader. Jerome Opeña on art is no different. You look at these pages, and you know instantly that these babies were not rushed to meet looming deadlines. Opeña is careful, crafty, and deliberate, and the results are a joy. On the surface, this is a black ops book. It’s assassinations and unspeakable deeds; it’s an X-Men book that’s not very X-Men-like. But read deeper, and you know these characters are about much more than that. This isn’t just about taking out threats before they become threats; this is a story of addiction, inferiority, self-worth and self-hate, fear and perceived altruism … and so much more. But Remender lets you figure that out for yourself; it’s underlying, and he doesn’t beat you over the head with it. I love that. The mark of a good writer. Big changes are coming up for this team, and I can’t wait to find out what Remender has planned for the next year of this book. Best one on the X-shelf. This entry was posted on 11/17/2011 by ravenhaired. It was filed under Comic books, Female Characters / Creators, Reviews and was tagged with Action Lab Entertainment, Ardian Syaf, Batgirl, Boston, Clay Mann, DC, DC Reboot, Gail Simone, Image, Infinite Vacation, Jeremy Whitley, Jerome Opena, Magneto, Marvel, New 52, Nick Spencer, Princeless, Rick Remender, Scottie Young, X-Force, X-Men.